Notary publics can perform marriages in three states, not including Georgia. 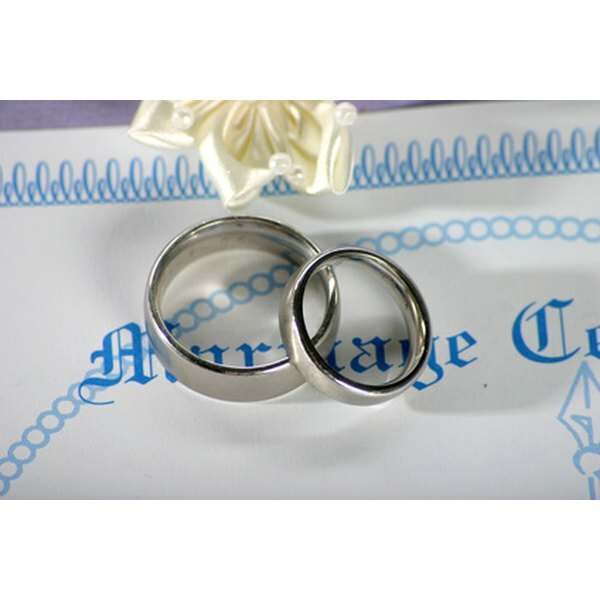 1 Who Can Legally Perform Marriages in Illinois? Title 19 of the Georgia Code governs the laws relating to marriage, including who may legally solemnize, or officiate, a given marriage. Only three states have laws permitting a notary public to officiate marriages. Georgia is not one of them. According to Section 19-3-30 of the Georgia Code, only certain parties may officiate marriages within the state. These include magistrates, ministers, religious officials authorized by their religious societies to perform marriages, city recorders and judges, including judges at the state and federal level. According to the Florida Division of Corporations, notaries public are licensed to solemnize the rites of matrimony in only three states: Florida, South Carolina and Maine. In Florida, the marriage license must be retrieved from an authorized official before the notary public may perform the marriage. Section 19-3-42 of the Georgia Code states that if two parties are married in a manner where all aspects are legal except that the official solemnizing the marriage is not authorized to do so, the marriage is still valid so long as the parties believed it was a legal marriage at the time. Therefore, if a notary public marries two people in Georgia, their marriage is valid if the marrying partners did not know it was illegal. Do You Need to Consummate a Marriage Legally?